Representing approximately 2,000 Chicago Department of Streets and Sanitation workers, James F. Ellis Jr. stands at the forefront of Laborers’ Local 1001 as their Business Manager. 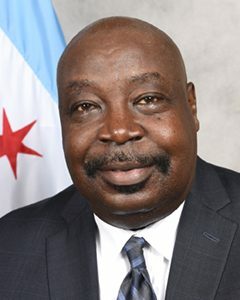 Capitalizing on his natural ability to relate to a variety of audiences, James spent more than 20 years ensuring ongoing communication between Local 1001 and Chicago’s governmental offices by providing insight to potential issues, gathering pertinent data and assessing program effectiveness. A calculated risk-taker with deep community roots, James has championed and raised issues that respond directly to keeping Chicago’s alleys, streets and airports clean and in good repair. Throughout his 20 plus year tenure with of Laborers’ Local 1001, James has built a reputation for developing business strategies, incubating new business models and building on a range of community resources. James is an extremely accomplished organizer who provides excellent explanations and understandings of union goals and services. He consistently ensures long-term viability of Streets and Sanitation workers by creating flexibility to ensure union workers remain competitive in salary and on the job training, while assisting laborers and operators to become apprentices. James currently serves on the Dawson Technical Institutes Advisory Board of Trustees; Labor International Union of North American African-American Caucus and is a mentor at Fellowship Missionary Baptist Church and Maple Park Methodist Church. He is the past recipient of the Chicago Defender’s Top 50 Outstanding in Business and Community Awards and has been cited as an Outstanding Ambassador in community relations for the City of Chicago. A veteran of the United States Marine Corp and a lifelong Chicagoan, James is married and has three adult children.